The Victron Quattro 8000VA inverter charger is perhaps the largest on the market that can still operate at 24V and 48V. From boats to military installations, the superior quality of Victron Quattro inverter chargers makes them ideal for a huge range of top-end remote power and power backup systems. The added function of being able to manage two different AC sources, as well as power from the DC battery bank, and switch between all three, makes them an invaluable tool for the power management market. 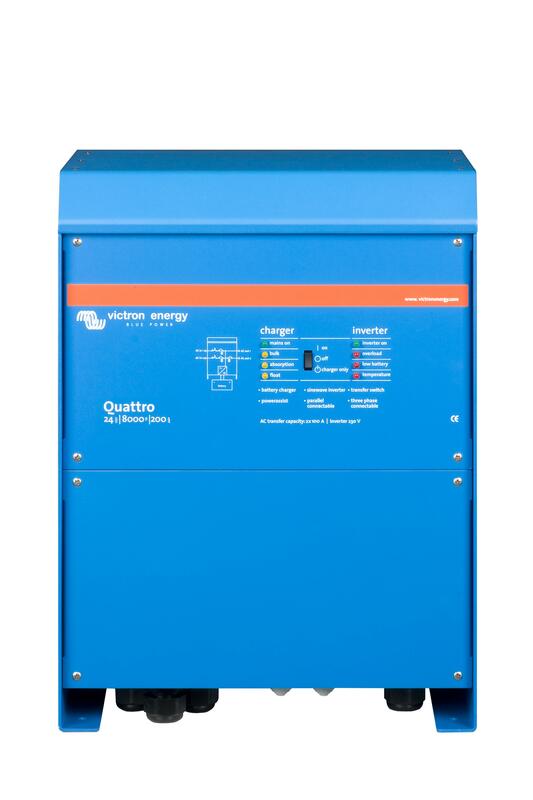 Up to 10 Victron Quattro inverter chargers can be set up to operate in parallel, so that ten 8000W units, for example, will provide 70kW - 80kW of usable power and a massive 2000A charging capacity.